I'm a working mom. My husband is a working dad. Between school, daycare, preschool, and our jobs, we're not home a lot during the day which makes getting meals on the table more than just a little challenging some days. We manage to have dinner as a family at least three times a week, but I'll be honest and admit that one of those times is out - usually at a fast food joint. So when I heard about the new Marie Callender's bakes, I was not just interested, I was downright intrigued. Good meals that I could microwave and that came with better nutritional stats than our fast food dinners? Sign me up. First I sent my husband to the grocery store and he came home with the wrong meals. (Who knew Marie Callender's had so many frozen meal options?) Then I went and surveyed the "bakes" options. The trick, which I did not know when I dispatched my better half, is to look in the family meals section of the freezer aisle, not the single entree section. I looked at the options offered by our grocery store - I really wanted to try the three meat and four cheese lasagna, but it was not meant to be. 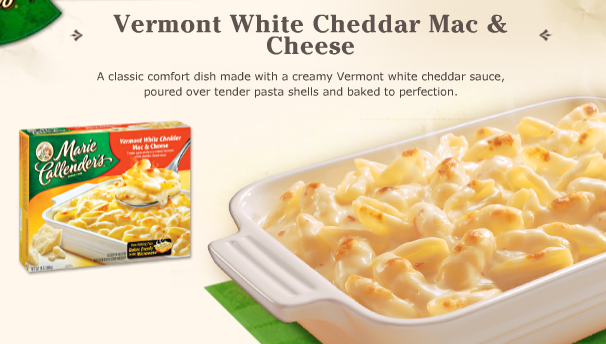 Instead I brought home the Vermont White Cheddar Mac&Cheese. It wouldn't do for a family dinner, but if it meant I could get dinner on the table for the girls in under 10 minutes, it was definitely worth a try. Plus, the box made the Mac&Cheese look both harmless and delicious. Tonight, at long last, I finally pulled the package from the freezer and popped it in the microwave. 5 minutes later I was drooling as the smell of melted cheese filled the kitchen. Another 4 minutes later and I was pulling dinner out of the microwave. I added some turkey slices and fruit to their plates and served up dinner. I wish I could tell you that both children fell over themselves as they gorged on mac&cheese. Sadly that wasn't the case. At first I thought it was because I've spoiled my kids with homemade mac&cheese (they won't even eat the stuff out of the box any more...), but after tasting it I understood. The benign dish pictured on the box had an unexpected kick to it. I sat down at the table and grabbed a bowl. The cheese was perfectly cheesy and the red pepper flakes gave the creamy noodles a tasty - somewhat more grown-up - twist. Side note: I'm an avid nutritional content checker and this dish compared admirably with other leading brands of frozen mac&cheese. It even bested them in the protein and vitamin department. Want to try for yourself? You're in luck! I have two sets of Marie Callender's coupons - one free dish and a few discounted dishes - to give away to two lucky readers. To enter leave me a comment sharing a quick dinner short-cut that works for you. Bonus entries: Tweet or Facebook this giveaway. Please be sure to come back and post the direct link to your tweet or Facebook post. Giveaway will close at 10pm Tuesday, Dec 7th. Please note, I was compensated by Marie Callender's and TheMotherhood for this post, but all opinions expressed are mine and mine alone.